Welcome back to another swatch! I have to admit, I miss my regular posting schedule, but now that I work weekends almost exclusively, I just get them done when I can. Swatch Tuesday doesn’t have the same ring as Swatch Saturday, I have to admit. 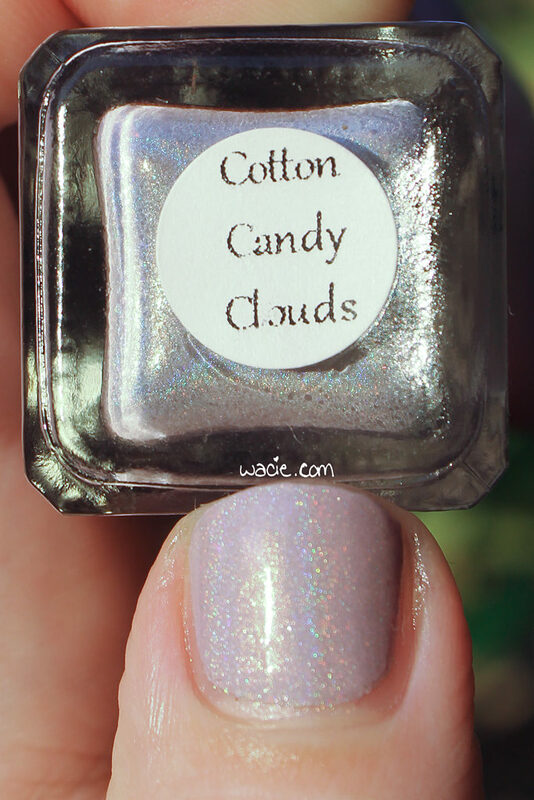 Anyway, this is Cotton Candy Clouds from Blue-Eyed Girl Lacquer, an Addicted to Holos box exclusive. I’m wearing three coats with one coat of Seche Vite. 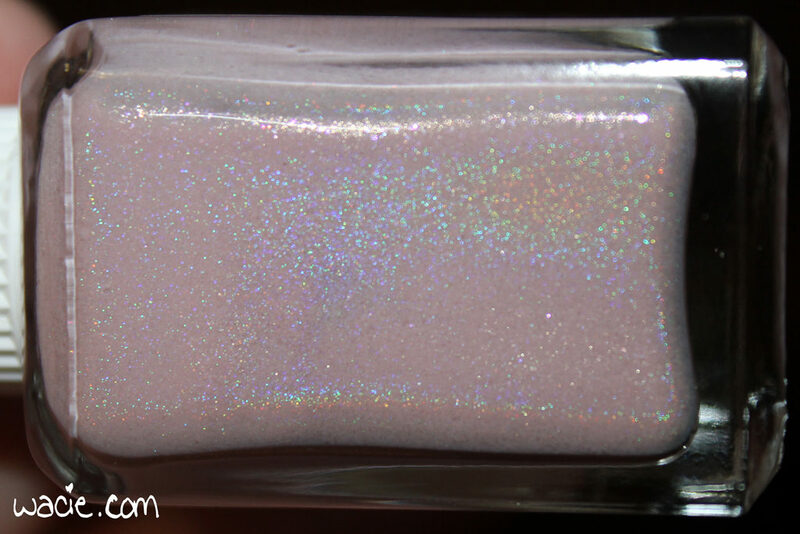 Cotton Candy Clouds is a pale lavender holo with green shimmers. Application was pretty typical for a BEGL holo; the formula is designed to be opaque in as few coats as possible, and this one definitely does; I got an almost-opaque first coat and the second was enough to even it out. 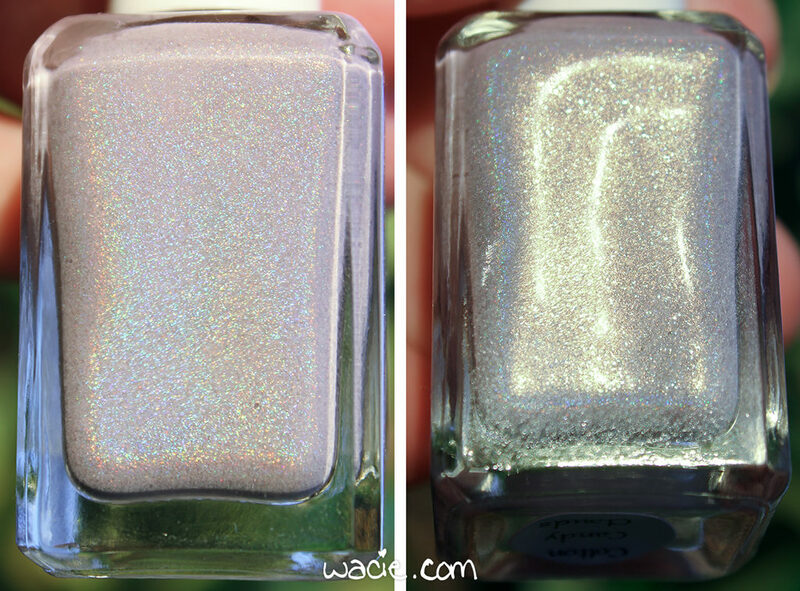 The holo isn’t too strong because the base is so well-pigmented, but it’s definitely there, as is the green shimmer. The polish dries to a smooth and somewhat glossy finish; I used top coat for shine. I miss the Addicted to Holos box. So many amazing polishes came from that box, and since they haven’t posted since 2016, I’m guessing it’s been shelved. There are so many boxes now, as well as the Polish Pickup, that a lot of these smaller ones got squeezed out, which is sad. I’m especially sad because it was one I bought routinely. Blue-Eyed Girl Lacquer polishes are available from their online shop; the shop is on hiatus while the maker is on maternity leave. Happy Monday, reader! Remember crackle polishes? Today I dug out an old polish, one of my first-ever China Glazes and one that crackles, no less. Sometimes I forget how long I’ve been doing this nail polish thing, and this polish comes as a stark reminder. 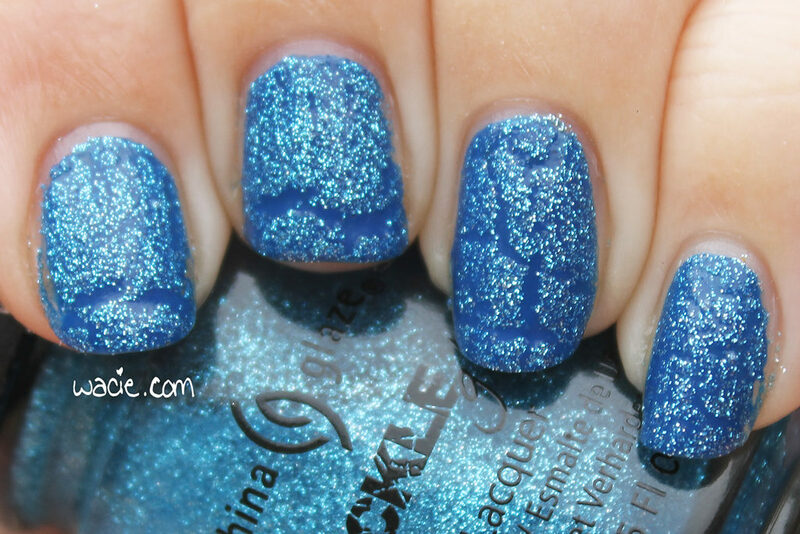 This is China Glaze’s Gleam Me Up with Blue-Eyed Girl Lacquer‘s Lighthouse on the Lake. Lighthouse on the Lake, this beautiful deep blue creme, has been a big player in my collection recently. I’ve used it as undies for glitter swatches and nail art, and it always looks great with whatever I pair it with. That’s really true for every BEGL creme, but this is the one I’ve used most often. I can never get good macros on cloudy days. Gleam Me Up is blue glitter crackle madness. I don’t even hate this polish. The glitter is dense enough that the crackle effect is crisp, but lets enough of the base color through so that everything is uniform. Honestly, it’s a fun combo. I kind of want to get some other crackles out to see what I’ve been missing. Blue-Eyed Girl Lacquers are available from their online shop; BEGL is currently on hiatus while the maker is on maternity leave (!!!). China Glaze polishes are sold in stores. Hey, reader! I’ve got another swatch for you. This is ellagee‘s Elva; I’m wearing three coats with one coat of Seche Vite. 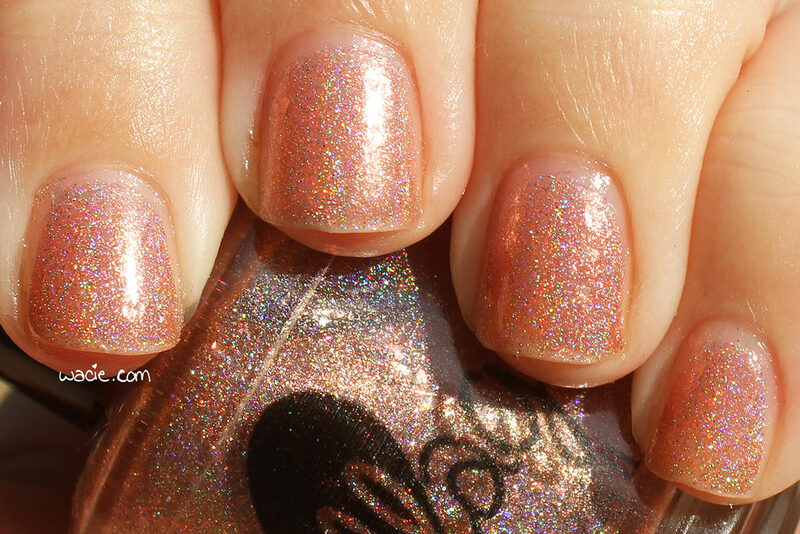 Elva is a sheer blush pink holo with iridescent flakies. Application was easy; the product consistency is easy to work with, and the flakies spread out well over the nail. The first coat goes on very sheer, and though coverage does build with additional coats, nail lines are still visible even after three coats. You can’t see it so well in these photos because my nails are short, but it’s there. 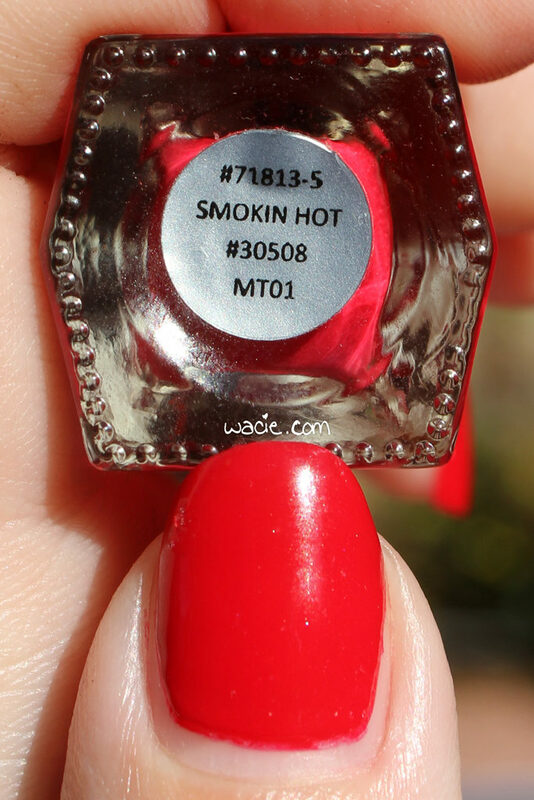 The polish dries to a smooth and glossy finish. Elva is such a delicate polish. 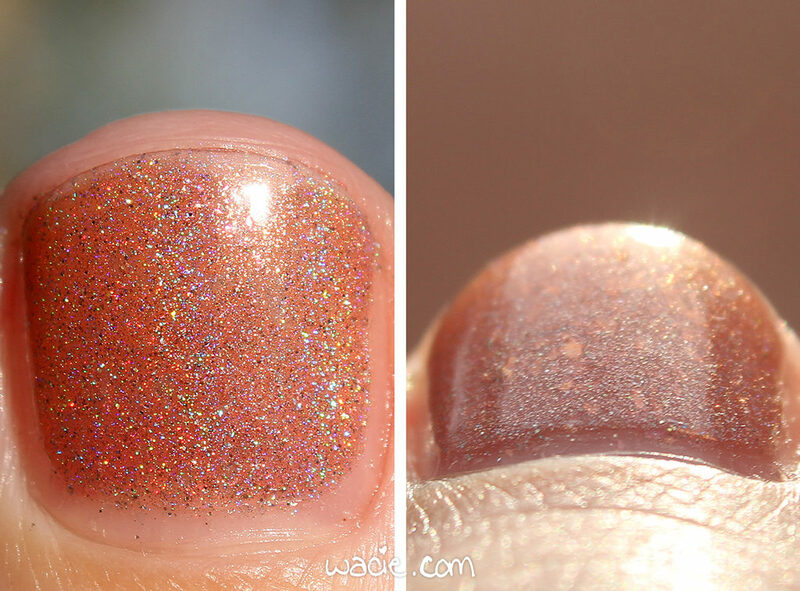 The sheer polish gives way to a powerful holo effect, and in the shade, you can see the flakies come out. It’s versatile, too; you can wear it alone as I have here, one coat alone for a small bit of sparkle, or use it as a topper. So many options! 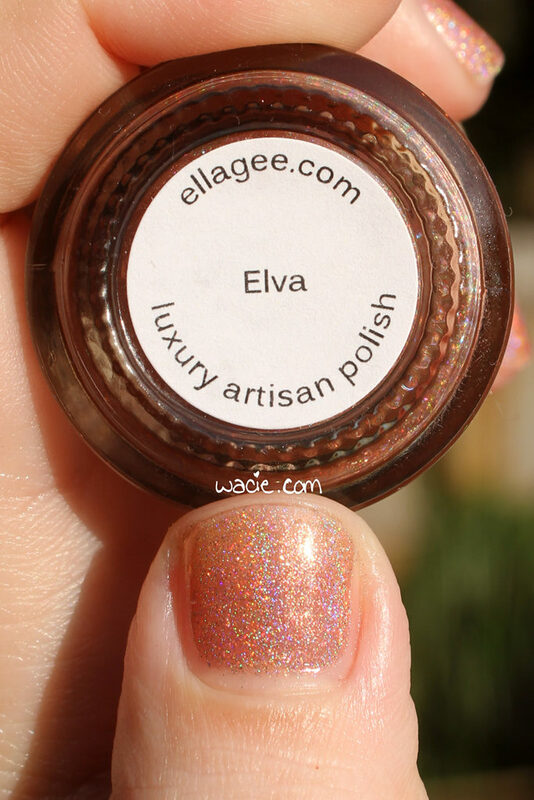 Elva was discontinued by ellagee. As of this writing, ellagee is on hiatus. Happy Wednesday, reader! I’ve been slacking on getting my swatches posted. This is yet another Blue-Eyed Girl Lacquer prototype called SO 1.0; I’m wearing three coats with one coat of Seche Vite. SO 1.0 is a cool candy pink polish with shifting blue-to-purple shimmers. 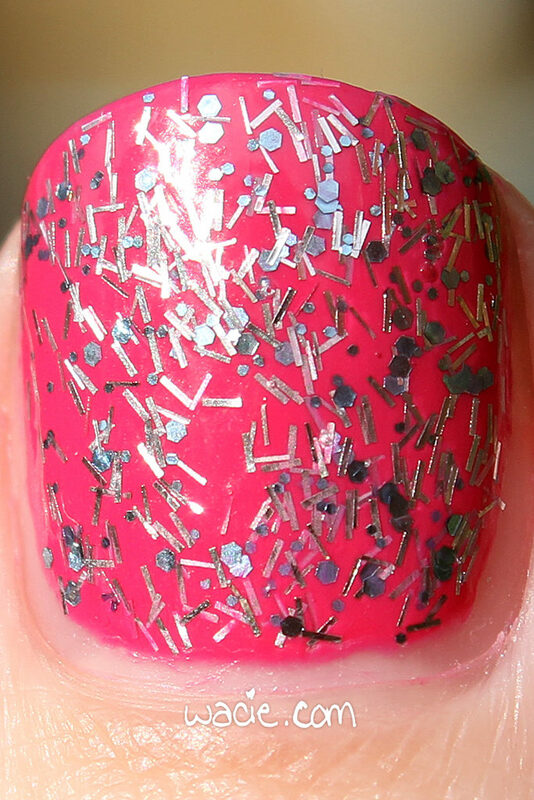 Application was pretty typical of a BEGL polish; the product consistency is pretty much perfect. The polish goes on a little sheer on the first coat, but coverage evens out. It dries with a bit of a satin finish; I used top coat for shine. I love this polish a lot. This shade of pink is one of my favorites; it reminds me of fruit, of candy, of a color my hair used to be. There are lots of feelings wrapped up in this pink. The shimmer and shift add a bit of sparkle and dimension that pushes it just a bit farther. I felt a little bad taking it off. BEGL polishes are sold on their online shop. I actually got this bottle from a destash, but I can’t remember who. If you’re reading this, let me know if this was previously yours! Welcome back, reader! It’s Monday, and I have some nail art for you. At least, if you can see it. I’ve had a string of these tone-on-tone manis that were all fails; the most recent before today was this silver-on-silver look I wore over the weekend, a look that worked in my head but looked completely different on my nails. 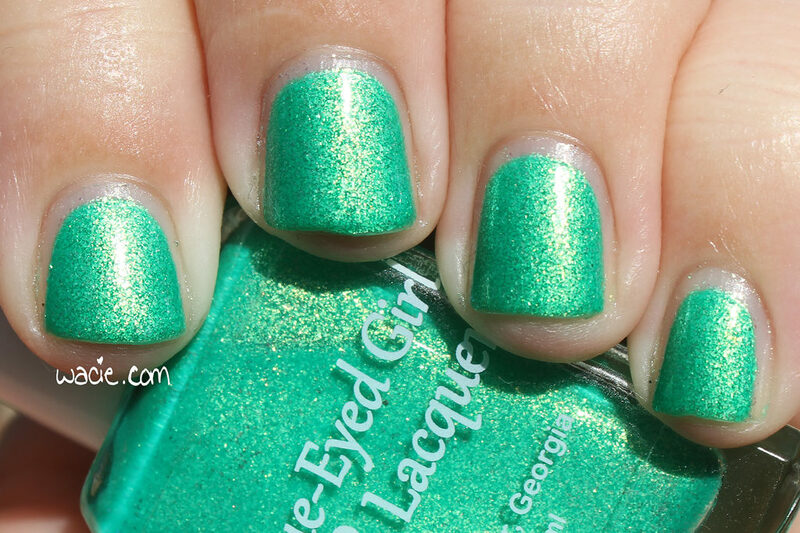 This is Enchanted Polish‘s Good Life with Literary Lacquers‘s I Heard the Bells. Good Life is an excellent polish. It’s such a strong gold polish, it’s got a strong holo, and it has this gold-to-green shift that completely changes the tone of the polish. It’s this cool-toned shift that makes the nail art visible. I did a few criss-crosses with striping tape, hoping the difference between glitter and holo would create some distinctive lines. There’s not enough contrast without the shift. The art got a little messed up on the ring finger. I’m a little grateful you can’t see it. I Heard the Bells is a pretty wonderful polish too. 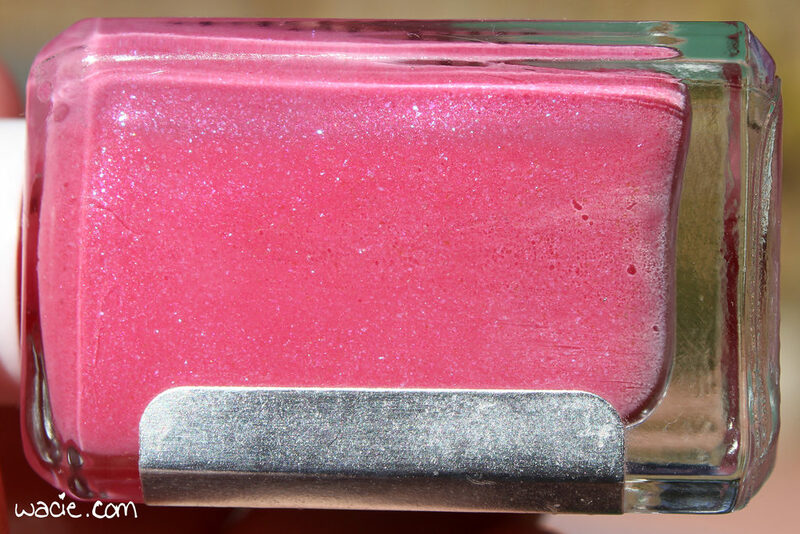 It’s full of fine glitters, but doesn’t dry with a texture, and it’s actually pretty easy to take off. I always get this polish out around the holidays — it is a holiday exclusive, after all — and incorporate it into a Christmas mani, but since I had it sitting out, I couldn’t resist using it. It’s a shame you can’t really see it here. Enchanted Polishes are sold in their online shop. Literary Lacquers are sold on etsy. Welcome to another swatch! Today’s swatch is Hitsujiyama Park from Elevation Polish; I’m wearing three coats with one coat of Seche Vite. 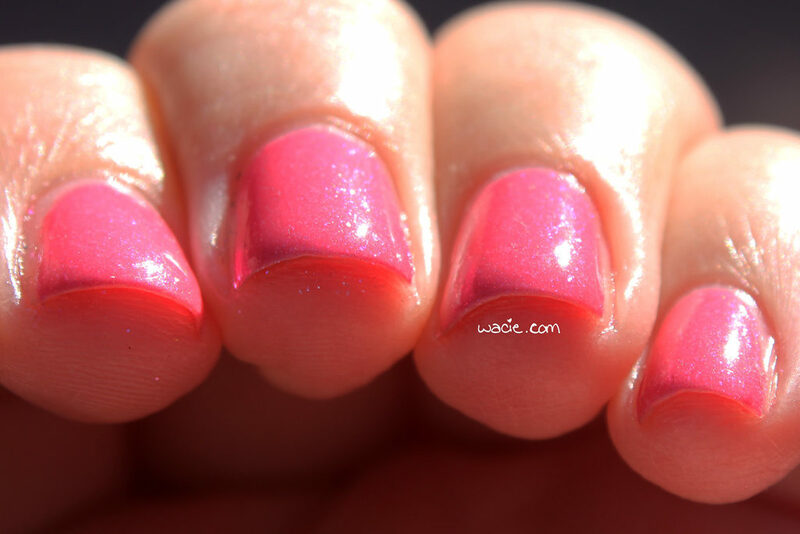 Hitsujiyama Park is a baby pink polish with a faint holo effect and fine pink shimmer. 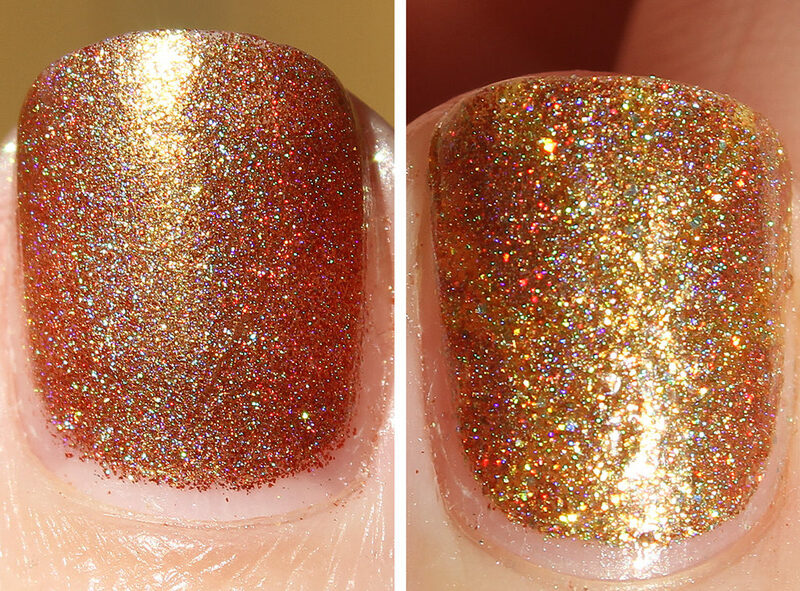 This polish has a Goldilocks consistency, one that applies smoothly but doesn’t flood cuticles. It’s also fairly opaque; I got full opacity on the second coat, but even one generous coat might be enough. The polish dries with a satin finish; I used top coat for shine. So one thing I want to note is that I used my camera flash in indoor lighting for these photos. Do you ever find yourself delving into a holo-heavy nail art look, only to find that it’s going to be cloudy all week? If I remember correctly, it stormed on the day I took these, and ambient lighting in my house wasn’t adequate, so the camera flash was the best way to get the holo. 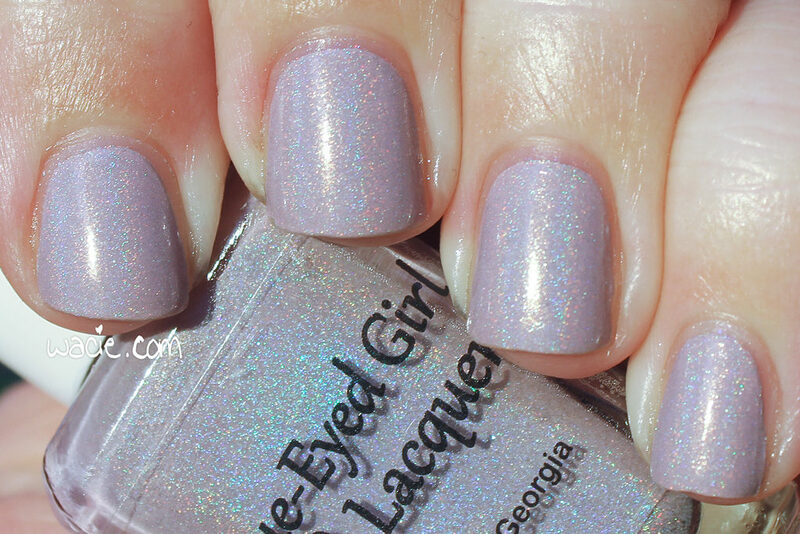 The holo in this polish is so barely-there, which I love. It’s an afterthought to the delicate pink base. It’s super dainty. Hitsujiyama Park and other Elevation Polishes are sold in their online shop. Welcome to another swatch post! I’m trying to get one out every day this week. I have so many you haven’t seen yet! This gorgeous beauty is a Blue-Eyed Girl Lacquer prototype called CH 5.2; I’m wearing three coats with one coat of Seche Vite top coat. 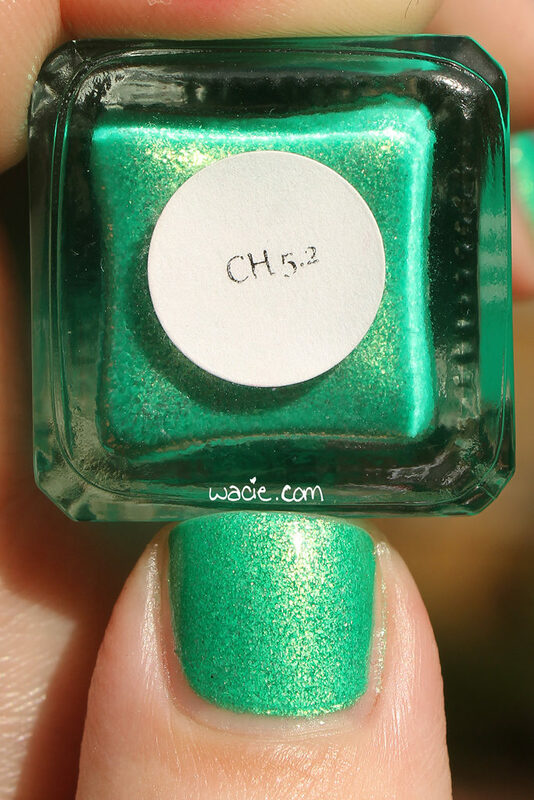 CH 5.2 is a kelly green jelly with gold-to-green shifting flakies. Application was easy, as it always is with BEGL polishes; the product consistency, despite being totally full of flakies, is buttery smooth and very easy to work with. It dries with a satin/matte finish; I added top coat for shine. 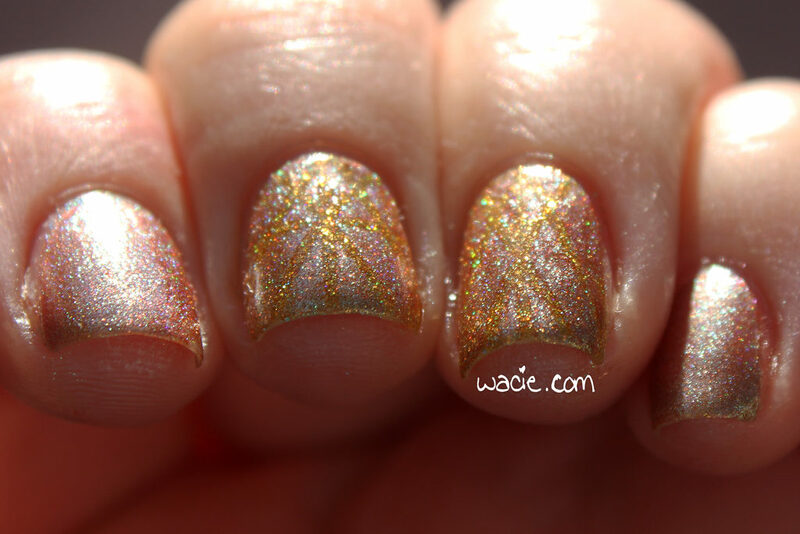 This is a fantastic polish, and I’m kind of sad it wasn’t available in a wide release as-is. The gold flash is a lot more intense in person, as is the shift. Also, it’s green, and I feel like BEGL greens are some of their best work. I definitely love this one. 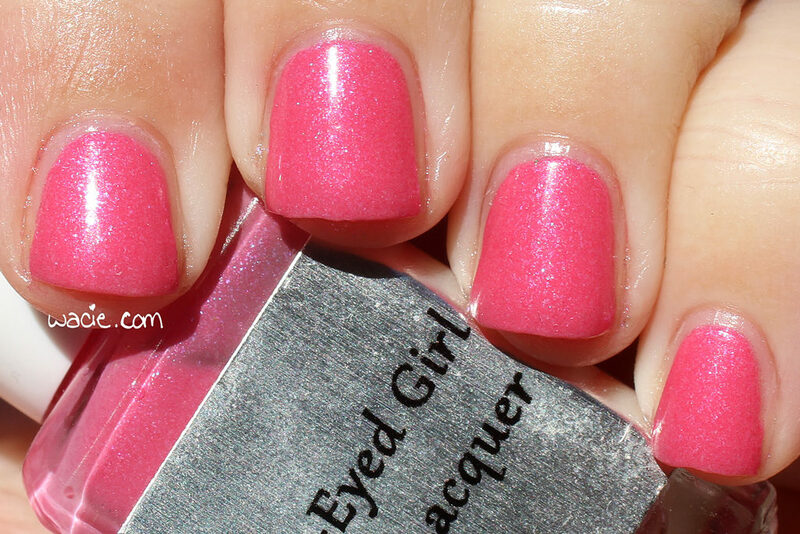 Blue-Eyed Girl Lacquers are available in their online shop. Welcome back! Today’s swatch is a pretty basic one. Everyone knows I love a red creme, and even though this is one you can’t get anymore, it’s a good one to have. 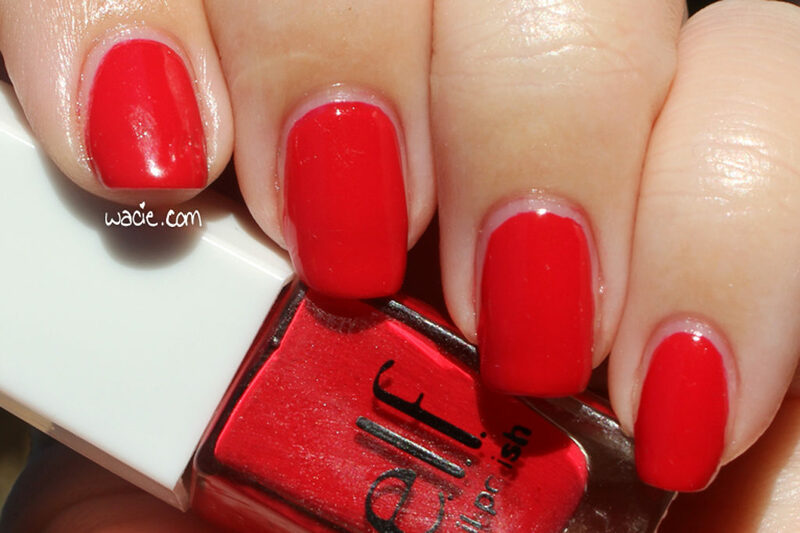 This is e.l.f.’s Smokin Hot; I’m wearing three coats with one coat of Seche Vite. Smokin Hot is, as I mentioned, a red creme. Application was good; the product consistency was on the thicker side, but I believe this is due to the age of the bottle, as well as previous uses. I forget if I thinned it out or not, but it still applied well. I had full opacity by two coats, but I always like to go for three. The polish dried with a glossy finish; I used top coat for protection and shine. This is a polish I probably didn’t even need to swatch. 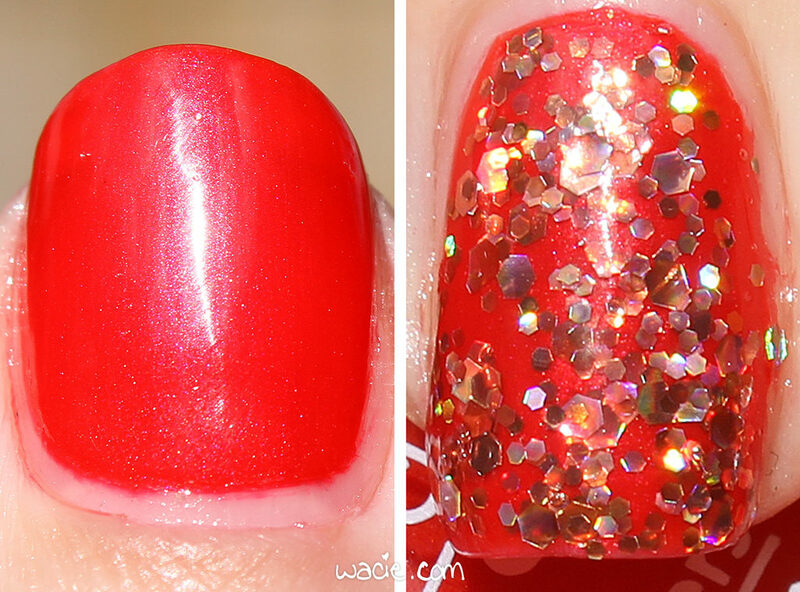 As with most red cremes, what you see in the bottle is what you get on your nails. I can’t complain about this polish at all. 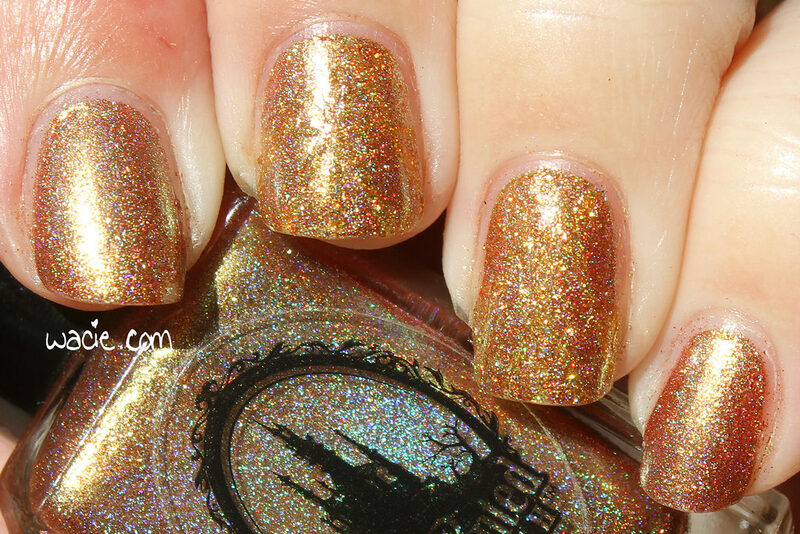 This polish was released in a Disney Villains themed set, which has since been discontinued. Happy Monday, reader! I have a pretty simple look to show you this week. This is Essie’s Frilling Me Softly over Marc Jacobs Beauty’s Shocking. Let’s get into it! Frilling Me Softly was the main polish I wanted to try this week. If we’re being honest, I wasn’t huge into this Essie collection, but I still bought them all to keep my LuxEffects collection complete. I have a serious problem when it comes to completing collections. I don’t know how popular these actually were among bloggers because I didn’t really see anyone talking about them; I know bar glitters are a point of contention among us, and I thought maybe that’s the reason. This one’s not too bad since they’re short. At least it gives some sparkle. I used Shocking as the base as a treat. I like to use nice cremes under glitter toppers; I feel like it improves the manicure. My favorites to use under glitters are thermals and indie cremes, but sometimes you need a little luxury. I’m almost a little sad I covered this up, because even without top coat, Shocking had a gorgeous glossy finish. I’m looking forward to wearing this one on its own. Frilling Me Softly and other Essie polishes are sold in stores. Shocking and Marc Jacobs Beauty is sold at Sephora.